Lots of excitement aboard FPB 78-1 Cochise in the last 24 hours, and a series of milestones. Cochise has seen the 9,000th NM roll under the hull, passed 1,000 hours on the engines, cruised into the sixth parallel north of the equator, and had some lovely downwind passaging weather. The crew have watched a daytime movie – “Beyond Reasonable Doubt” – which is a first for all of them in many hundreds of thousands of miles at sea. The Steves (Parsons and Dashew) have been working on the Maretron N2K system the entire voyage. At a later date we’ll do a detailed look, but for right now know that this monitors many things going on around Cochise. The photo above is of what we call “Watchkeeping” mode, and is on the desk monitor in the great room whenever we are underway. N2K View makes it easy to create various types of data presentation tools. Most of what you see in these two photos are the tip of the info iceberg, so to speak. There are pages with more detailed info available with the tap of a finger or click of the mouse. This is the first time since launching that Cochise has been able to run free for long periods, in ocean crossing conditions. We have been running at different speeds, averaging the data acquired to form a database for future use. These numbers are inclusive of the energy necessary to produce the electrical and hydraulic power aboard, since both come from the engines. They include a favorable current, a push from the wind that is for the most part dead aft, and a bit of help from the waves with surfing. They are meant to be nothing more than indicative of what a downwind ocean crossing might be like. 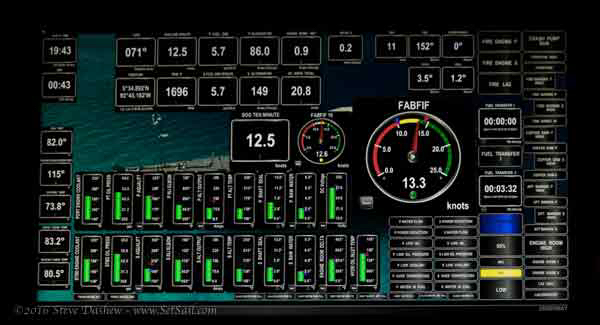 We have settled on using the desk monitor for N2K data presentation, and the large great room tv for the Simrad navigation package. This makes both easily viewable from anywhere in the great room. The example above is from last night when we went through a massive line squall, 36 miles in length. The radar image in the bottom right window is our overall general coverage screen. 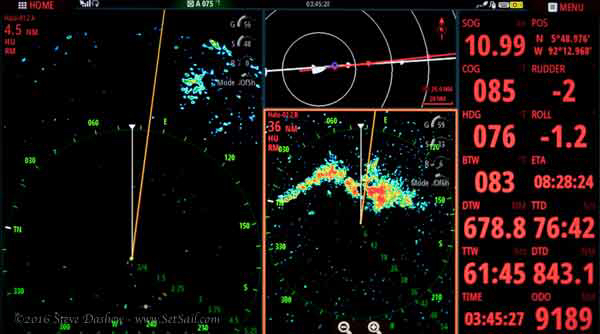 The larger lefthand screen shows the close-in radar, and offset of that we get maximum view ahead of the boat. Upper right is a small chart plotter window. 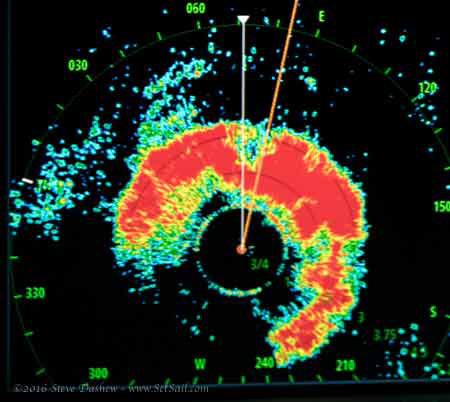 A radar detail of the squall is shown above. The hour long fresh water deluge provided a welcome rinse and clean. Finally, a highlight and mystery of the trip above. We saw this lovely raptor circling this morning. He made several attempts at landing until finally sticking one on the end of the port boom. We are pretty sure it is an osprey, but what it is doing mid-ocean we haven’t a clue. The closest land is the Galapagos, 250 NM south. After resting for an hour, he took off for parts unknown. This was at 05.5° N 91.33° W. If any SetSailors have info on ocean-going osprey like this guy, please share with us. This entry was posted on Tuesday, November 8th, 2016 at 3:10 pm and is filed under Dashew Logs, FPB 78, The Logs. Both comments and pings are currently closed. The variation of timing and duration in autumn was more variable than in spring. Although migrating predominantly in the day, they sometimes fly in the dark hours particularly in crossings over water and cover on average 260–280 km (160–170 mi) per day with a maximum of 431 km (268 mi) per day. 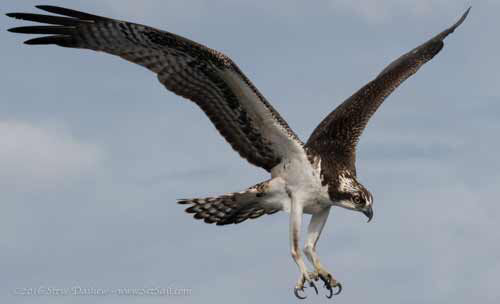 European birds may also winter in South Asia, an osprey ringed in Norway has been recovered in western India. Thanks for sharing all your adventures. I am so impressed by this boat on so many levels. Just amazing & you already have 9,000 miles on her. In a few months you have covered more miles than many do in years. Superb job by you & the entire team. Congrats, job very well done. Wonderful Radar photo of the massive squall. I bet COCHISE enjoyed her fresh water shower!! 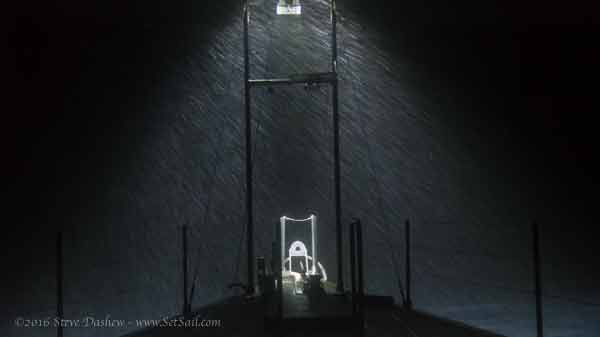 How we used to love these fresh water laden squalls aboard KANDARIK!!! Missing that so very much, and envious of your wonderful photographic and descriptions of your passage across the Pacific! !